Today you'll be greeted by a new navigation menu for AppSignal when you sign in. We've improved the navigation to help you focus on different tasks and to make it easier to find the data you need. Over time we've made it easier to divide your app into separate namespaces. This allows you to treat parts of your app – like web requests, background jobs or an API – differently. Where previously the Errors, Performance, Actions and Host usage navigation repeated for every namespace, we've now merged these navigation elements together. Namespaces can now be filtered with the new namespace filter at the top of relevant pages (Errors, Performance, Actions, Host usage, etc.). This provides a complete overview of the errors and performance incidents for your application across all namespaces. Never miss an error again! 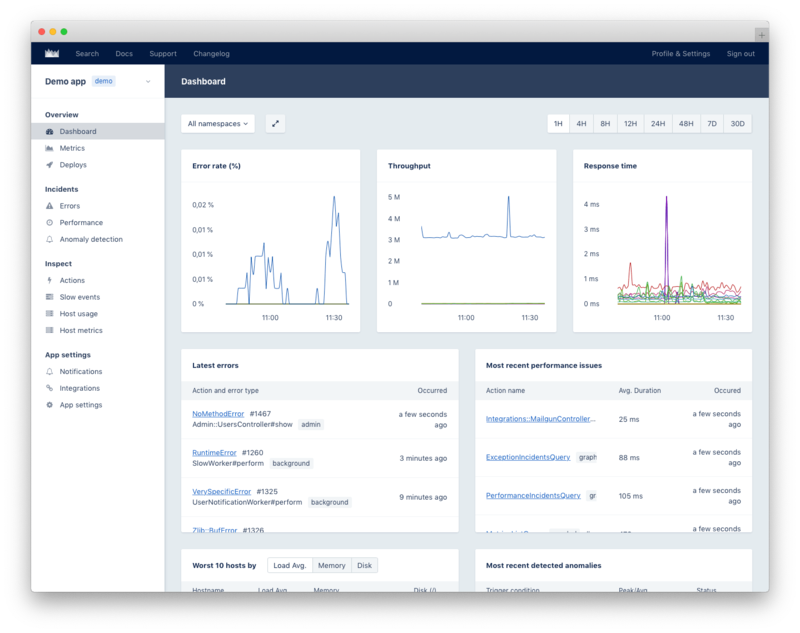 Just like on the Dashboard, Incidents will have a label indicating which namespace they occurred in. Graphs will show separate lines per namespace so it's easier to compare the performance of all your namespaces. We've divided the navigation into four sections which help with the different types of goals you're visiting AppSignal for. Either to get an idea how your app is performing, to debug a specific issue you've been notified about or to dive deeper in the data of your app to see where an issue may have originated from. The Overview section is the entry point to your app. Get insights on the highest level. This section features the Live updating Dashboard which gives you an overview of your app. 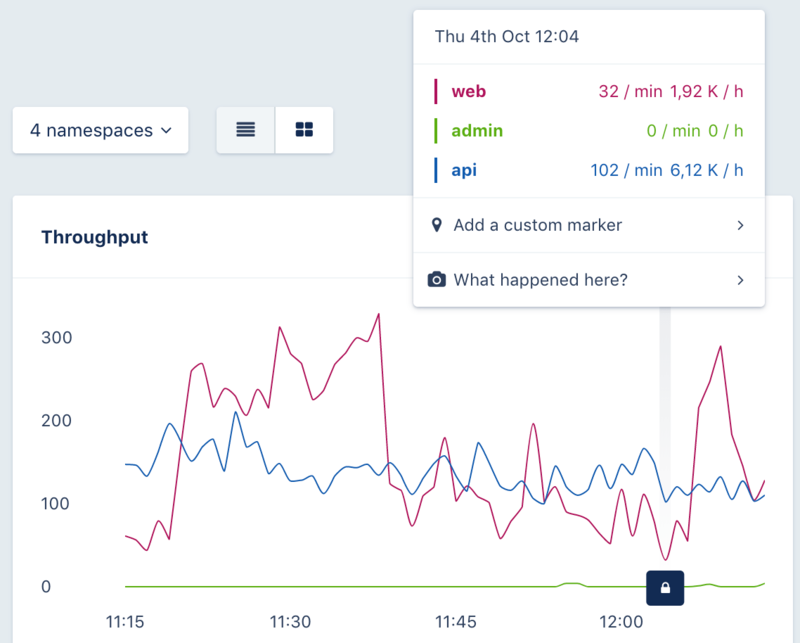 Create your own dashboards with (Custom) Metrics to get even more insights into your app. And finally, compare Deploys for your app. See how your app is doing compared to previous deploys to see if your app is improving over time. The Incidents section is where you'll need to be when an error occurs in your app, when an action is performing badly or an Anomaly is detected. Notifications you'll receive from us will send you to this section. The Inspect section provides you with a deep dive into your application. This is the place to be to find out how your actions/event-types/hosts are performing compared to the rest. This will be where you can manage your notifications, integrations and other settings. As always, notifications can be configured on a per namespace basis, so those slower background jobs don't cause the same notifications as those blazing fast API requests. Whether you are new to AppSignal or an experienced customer, we believe these changes are an improvement for everyone. But we are also very curious about your thoughts and suggestions on how we can help you navigate AppSignal even better. Let us know at @AppSignal or at support@appsignal.com!